TORONTO — Auston Matthews set a franchise record for the 102-year-old Maple Leafs on Monday night but his eyes are on the rest of Toronto's season. Matthews scored in a four-goal second period as Toronto downed the Buffalo Sabres 5-3 on Monday night. Matthews's goal made him the first Maple Leafs player to score 30 or more goals in the first three seasons of his career. "It's pretty humbling," said Matthews, who had 40 goals in his rookie campaign and 34 last season. "Luckily my first years I played with great players on any given night. Guys that can move the puck and make plays. 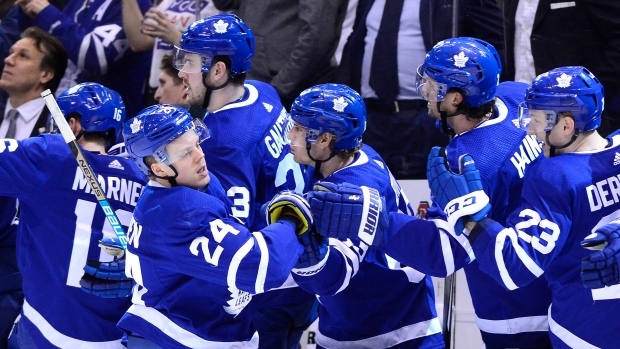 John Tavares, Frederik Gauthier and Tyler Ennis also scored in Toronto's four-goal second period as the Maple Leafs (38-20-4) held on for their second straight win. Kasperi Kapanen added some insurance with a short-handed, unassisted goal in the third. Toronto general manager Kyle Dubas was fairly quiet on the NHL's trade deadline Monday afternoon, only sending Par Lindholm to the Winnipeg Jets for Nic Petan in a swap of forwards. Toronto's big move came on Jan. 29 when it acquired veteran defenceman Jake Muzzin in a trade with the Los Angeles Kings. Frederik Andersen made 30 saves for his 100th win for Toronto, the eighth goaltender in franchise history to accomplish the feat, requiring the fewest starts to do it. Jack Eichel scored twice for Buffalo (29-25-8), while Sam Reinhart added a goal and an assist. "We had like seven or eight minutes of bad hockey where we let them get behind us, and that was it," said Eichel. "They had too many odd-man rushes in the second period, and it cost us the game." Carter Hutton started in net for Buffalo, stopping 9-of-12 shots in 25:52 of work. Linus Ullmark replaced Hutton in net, turning aside 19-of-21 shots. Buffalo also swung a deal with Winnipeg on Monday, sending defenceman Nathan Beaulieu to the Jets for a sixth-round pick in the 2019 NHL draft. The Sabres had acquired veteran defenceman Brandon Montour from the Anaheim Ducks on Sunday for blue-liner Brendan Guhle and a first-round selection in this summer's draft. Montour had not joined the team in time for Monday's game in Toronto. After Eichel opened scoring with a power-play goal in the final minute of the first period, the Maple Leafs came out flying in the second. Tavares redirected a slapshot from Muzzin past Hutton to tie the game 1-1 at the 3:48 mark of the period, nine seconds after a Sabres' penalty expired. Matthews scored while the announcer was still giving details on Tavares's goal. The puck deflected off a defender's skate and right to Matthews's stick. He made no mistake, swatting it into the net. Ennis made it 4-1 a little over seven minutes later on a breakaway. Gauthier assisted on that goal and on his next shift Sabres defenceman Zach Bogosian offered to fight him to complete the Gordie Howe hat trick. The Sabres answered back with 2:35 left in the second when Reinhart completed a tic-tac-toe passing play while Buffalo held the man advantage. Eichel scored nine seconds into the third period, cutting Toronto's lead to 4-3 and sucking the air out of Scotiabank Arena. Matthews took a tripping penalty late in the third but Kapanen stole the puck on a turnover and put away his 19th goal of the season on a breakaway with 2:18 left in the game.